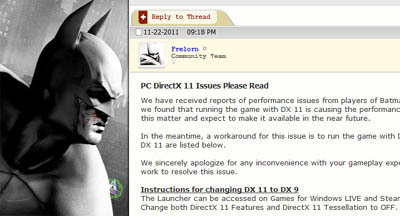 Arkham City for the PC comes out in the UK tomorrow but be warned, some players in the U.S have reported frame rate problems. It's not the older versions of DirectX that have compatibility problem, it's actually the new version - DirectX 11. Even with a powerful gaming rig, the Arkham City game sometimes drops its frame rate dramatically. This makes the game feel laggy and unplayable. Players have managed to fix the frame rate issues by rolling back to an older version of DirectX. If you experience issues, we recommend that you roll back to version 9 of DirectX instead of Direct X 11. Rolling back to DirectX 9 does improve the performance but at the cost of degrading the lovely graphics. DirectX 9 was last released back in 2004 and as you can imagine, things have moved on a lot in the PC gaming world. A patch for the game will be coming out soon to address the DirectX problems.